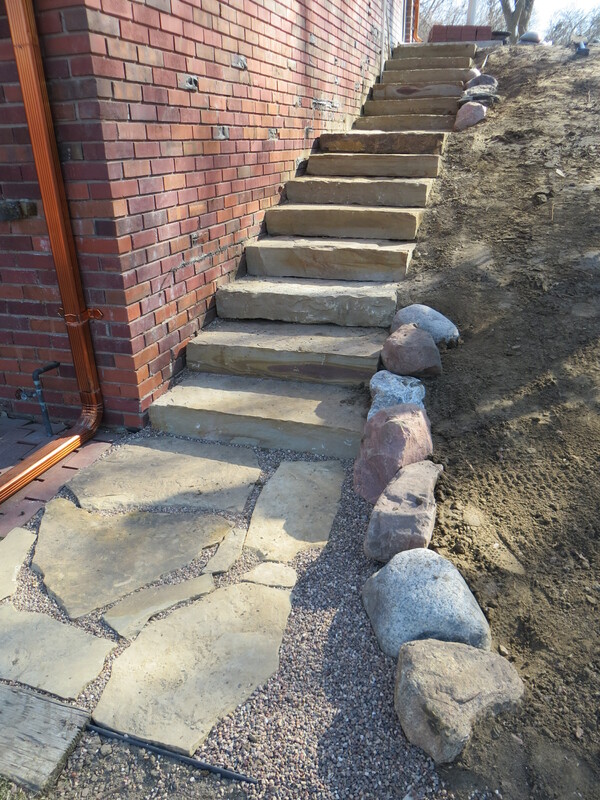 We installed new circle driveway and natural stone steps on the west side of their residence. Project involved a complete tear out of all front and side landscaping beds and setting in over 20 ton of Smoky Mountain Rock, Serviceberry and Maple trees and approx 40 bedding plants. Project took approx 8 days to complete. Completed May 7th on time and within budget. 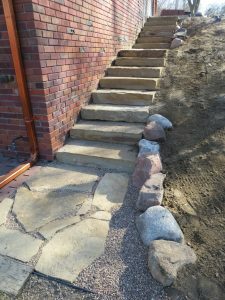 The stair case was constructed with Keota Buff 3’ x 6” steps and matching Keota Flagstone. 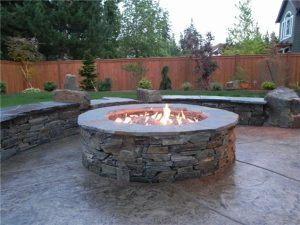 The Goldstein’s showed me a picture from Pinterest on how they want their new Patio and Wood burning Fire pit to look. What made this one unique was the Fire Pit is dropped down from the main patio by a 7” step. Basically created two gathering areas of different shapes that all were surrounded by a matching 18” border. A skin pattern was used for the stamping and notice we used the same color for the custom steps from the house and then on to the Fire Pit area. Completed April 27th. Took 5 days to complete. Also planted 4 arborvitaes, one Fat Albert Spruce and one Tulip Tree when on site. If you are interested in renovating your landscaping, give us a call and let the experts help you with the best product and within your budget. Arbor Hills Trees & Landscaping!